Way back in 1970, Donald Thorpe wrote a very good set of books on Japanese camouflage and markings. In fact, it is still the only book in English on this subject. Recently, there have been some very good references by Model Art of Japan on the subject, but since they are in Japanese, their usefulness to Western modelers in somewhat limited. Despite the now known glitches in Thorpe's books, it is still a standard and eagerly referred to by many modelers including myself. OK, so what does that have to do with decals?? 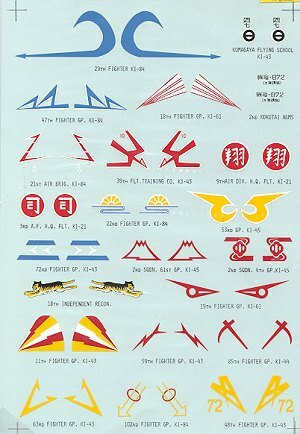 Well, Microscale produced three sheets of Japanese unit markings courtesy of that book so that poor JAAF/JNAF modelers would have something to stick on their Oscars and Tonys other than what comes in the kit box. Most of the subject material is for army aircraft as the JNAF was a bit weak on fancy tail markings. What I have for you is two of those three sheets (because the third sheet is missing a bunch of stuff). 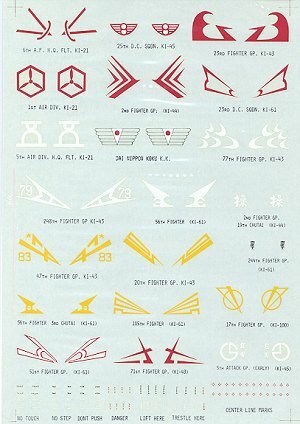 Rather than go into a long deal on what is on each sheet, I hope that you are able to read what is under each set of tail markings. Needless to say there are a lot of Ki-43 markings as well as the usual suspects like the Ki-44, 61, 84 and a few for the Ki-21 (now for a kit on this plane, Hasegawa!). Most of the markings are in register and quite usable, despite their age. One also gets some maintenance markings on sheet -69 (the sheet on the right) that could be very useful. As useful as this sheet is, there is no placement diagram at all for any of the schemes, the makers assuming that you have the Thorpe books to guide you!